675 is rated 4.7 out of 5 by 3. 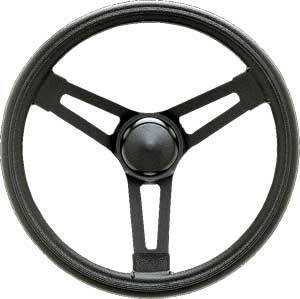 Rated 5 out of 5 by Highcrest 1 from classic look wheel bought this for a roadster project. It will fit your style and was a good quality product the powder coat finish was excellent. Rated 4 out of 5 by jcinaz from Fine but... Wheel is fine. Exactly as ordered. However horn kit doesn't work until you remove paint from contact area. Surprised a mechanic or engineer didn't think of that. And instructions were useless. Basically an exploded parts drawing. Whats the mounting pattern for this wheel?